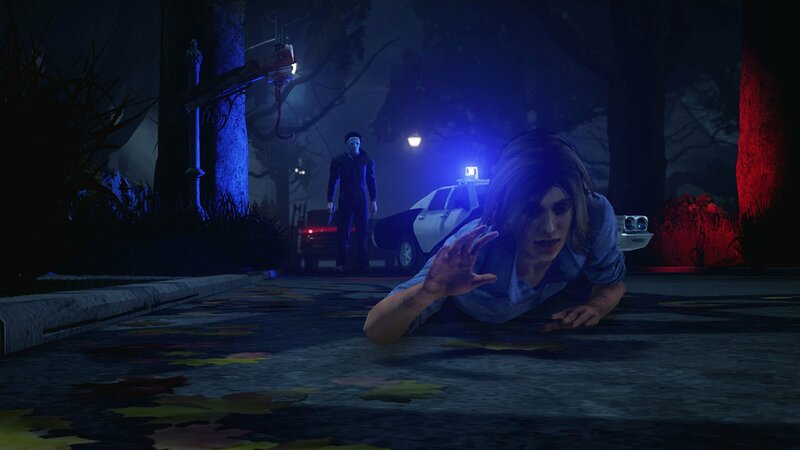 As we previously reported, Michael Myers and Laurie Strode of John Carpenter’s 1978 film Halloween have just joined the popular slasher-inspired video game Dead by Daylight. Available as of today, Oct. 25 (the 38th anniversary of the film’s original theatrical release), this latest update to the 4-on-1 game, which has been out on Steam since June, includes Michael Myers as one of the game’s killers and Laurie Strode as a survivor, along with a new map of Haddonfield, to be released fittingly on Halloween. According to the game’s official website, Evil Within is constructed around two phases. In the first phase, the Killer (Michael Myers) is weaker and slower, but has heightened detection skills. By gazing at survivors a gauge fills, and when full, the power enters phase two. In this phase the Killer is faster and more powerful, but loses the heightened detection skill. You become obsessed with one survivor. As long as your “obsession” is alive, you won’t have to wait as long as usual between your attacks. If you succeed to kill or sacrifice the survivor you’re obsessed with, the other survivors get a penalty to their repair, healing and sabotage speed. However, your “obsession” receives a bonus to healing and rescuing actions. Only one obsession per match. If Michael taunts the survivor he is obsessed with, he will get faster. Every time you chase your “obsession” and let them escape, your movement speed is increased until your next attack. Only one obsession per match. If you’re on Steam, you can purchase the update here. You can watch the official trailer and a spotlight video below, and then scroll down to view some new images! Watch Fan Propose While Dressed As Michael Myers!